I don't recall the title of the first romance novel I ever read. I have only a vague memory of the book's premise. But one thing I do remember was that the title was a historic romance. If you read romance novels regularly, if you attend writers conferences or if you keep up with what's going on in the industry, then you are probably aware that romance novels remain a popular genre of choice in our world today and that many of the titles purchased in a year are historic romance. Though historic is not the sub genre that I've chosen to write in thus far, I greatly enjoy purchasing these titles, and oftentimes the books that I wind up keeping on my shelf are set in historic times. What's so special about historic romance? Though many of us romance readers enjoy it, it's hard to say exactly what it is about it that we love about stories set in a time long past. Having read several excellent articles in this month's Romance Writers' Report about historic romance, and having just completed Cassie Edwards's Eden's Promise, I thought it only fitting that I attempt to actually answer this question, which I believe to be more complicated than it sounds. Simply said, there is something really magical about reading a story which is set in another place and time. Reading fiction is about taking a journey, experiencing some sort of escapism. What better way to do that than by way of a time and place and setting which is completely different from our own? What better way to create characters, scenarios and larger-than-life happenings than by doing so in a world unlike anything the reader of your story is liable to ever experience for herself? So why, with such a wonderful world of opportunities at my mind and fingertips, do I not write historic romance? First off, let me be clear that just because I haven't written a historic romance novel to date doesn't mean that I'm not interested in doing so, nor that I never will in the future. One thing I've learned as a writer is that my imagination is constantly surprising me and taking me to places I never believed it would. I did in fact draft a historic romance, which I intended to set in Regency England, only to decide later that the story I had in mind would work better in a contemporary setting. 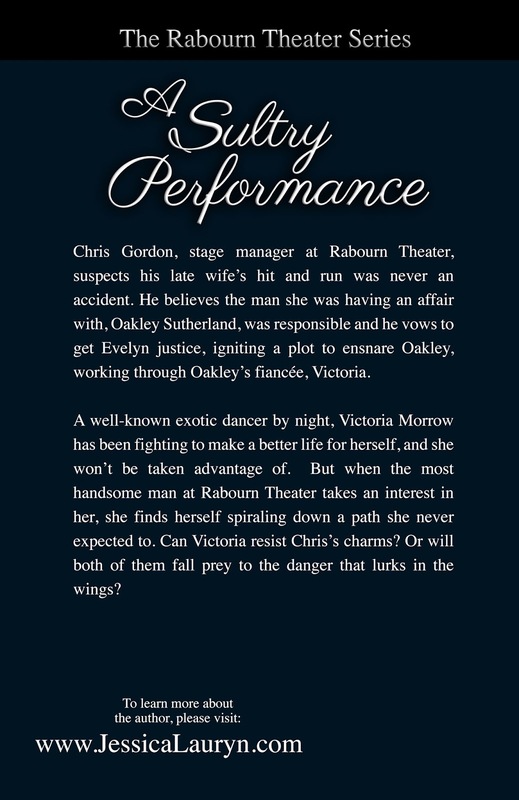 Truthfully speaking, the story in question, A Sultry Performance, would have likely worked as a contemporary romance or a historic, and my decision to make it contemporary had everything to do with personal preference. I honestly believe some writers don't feel they can create a story which is every bit as exciting as it can be, if they set it in modern times. Whereas I fully believe that they can, and with this thought in mind I have committed myself, for the foreseeable future, to creating suspenseful and innovative contemporary romance novels set in the present day. This does not mean however that I don't love to read the historic works of other authors. I love to mix sub-genres when I read, and I often read more than one story at a time. I find the historic romance novels I read to be engaging, exciting and greatly inspiring! A friend and fellow author once advised me not to read historic romances published many years ago. They don't speak true of the industry today, I was told, as the publishing industry has changed and with it, the guidelines authors will need to be aware of in order to secure a contract with a publishing house, or to sell books. Speaking to the opposing point, I've found I can learn a lot from these novels, which really weren't written all that long ago at all. Older novels often demonstrate the stark contrast between what is expected of an author today and what was expected 30 years ago, and they do so in black and white. As an author just starting out, it's good to know the history of the industry and I personally find that I'm inspired by authors who wrote during a time when the "rules" were not necessarily as strict as they are today. It is when we overthink the "rules" and work overtime to develop what we believe to be the story that we're "supposed" to write, when our creative mind shuts down, exactly what we don't want to be doing when attempting to write the story in our hearts! Reading Eden's Promise, I was reminded of how an exciting historic setting, like the one in this title, can make all the difference in a novel. For some time, I've been considering writing a series for which there are references to the past, flashbacks set in another time, as in, 100 years+ before the present day. I'm very excited to begin this next chapter in my writer's journey. Credit in many ways is due to the amazingly talented historic romance authors on my bookshelf! I enjoyed this pirate romance by Cassie Edwards! At the beginning, I wasn't certain I'd want to keep this one on my bookshelf - the romance between Eden and Zach happens so quickly. Though, there is so much excitement in this story I was able to let that go, in the end. Eden Whitney, a lighthouse keeper's daughter, who sometimes sneaks into town without her overprotective father realizing, finds herself drawn to the handsome and mysterious Zachary Tyson, a man we quickly learn is a former pirate. For reasons later revealed to us, Zach found himself engaged in a lifestyle not of his choosing, and which he would like nothing more than to leave in the past. But when local judge, Judge Pryor, learns of Jack's connection to the murderous pirate captain, Pirate Jack, he takes Zach hostage and threatens harm to Zach and Eden unless Zach will rid the seas of this dangerous man. The adventure only gets better from there! 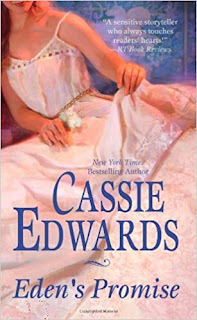 I loved this story, not only because it was incredibly suspenseful, but because Cassie Edwards creates a number of interesting characters, accounting for 3 different romances, and in turn, 3 happily ever afters. 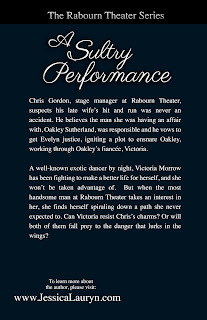 If you don't like engaging side characters, perhaps this isn't the read for you, but if you like a nice variety of things happening in a story, as I do, definitely give Eden's Promise a read!